Publicis New York is using its talents to raise awareness for Syrian refugees through a passion project with Doctors of the World (DOTW), an international human-rights organization that provides long-term medical assistance to refugees in Europe and the Middle East. In mid-December, DOTW sent a team including Publicis VP creative director Einav Jacubovich, DOTW USA’s Tamera Gugelmeyer and filmmaker Cano Rojas to the Syrian border near Aleppo to spend a week documenting the frontlines. 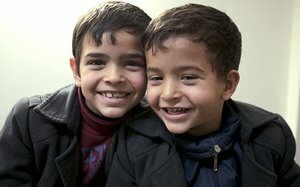 While visiting DOTW clinics and hospitals and meeting the patients there, the team discovered a powerful reason to feel fear in the face of this crisis—not fear of the refugees themselves but, fear of the world’s indifference towards them, they say. Although they were there gathering film for additional content, they were so moved by their interviews and experiences that they moved quickly to create a larger initial film in advance of the later, more in-depth content. The “Not Like Us” film illustrates with simplicity how strangely familiar and incredibly alike everyone is to a refugee. The 1:22 minute clip shows a variety of regular Syrians stating identifying characteristics, such as "I am a nurse," "I am a father," "husband," and "principal" intermixed with computer text printing commonly held statements like "they are all terrorists" and "should go back to where they came from." "Indifference is a disease," closes the video. It appears on the DOTW Facebook page and YouTube channel, though at this time, there are no additional paid support or additional efforts. However, “Not Like Us" will be followed with several others videos to roll out in the coming months. "While at the Turkey/Syria border, we've filmed numerous interviews with many Syrian refugees, some doctors and some patients," says Jacubovich. "From our interviews and footage we'll be creating content to release throughout 2017." All the work Publicis NY produced for DOTW was pro-bono, with the agency covering the production costs. "We have the ability to use our capacities as an international advertising agency to aid the world, and we're proud to do so," says Jacubovich. "We're extremely dedicated and aligned with DOTW's goals and beliefs, as a human-rights NGO devoted to aiding the world's most vulnerable populations." In the past two+ years, Publicis has been producing campaigns for DOTW for numerous initiatives, including raising money and awareness for the Ebola epidemic in 2014, the Nepal earthquake in 2015 and, for the past year, for its work in Turkey and Syria aiding the Syrian refugees. "We were more than happy to help them, pro bono, and instantly set up time to meet," says Jacubovich. "Within a week of our first meet-and-greet with the clients, we had launched our first campaign. We've been working together ever since."